Summary: An introverted drummer goes head-to-head with his cut-throat instructor in a battle to achiever musical greatness. My Thoughts: This movie is essentially a celebration of sound. However, while the brilliant sound mixing in this film not only makes the film as great as it is, but also furthers along the story, a sound celebration is not all that this movie is. When we begin the film, the sound of the drums is what we associate with a young man's dreams. Each CRASH and BANG from his drum set is what we associate with the feeling of out protagonist slowly moving toward achieving his goal of being a successful jazz drumer, a happy feeling. However, it is later that we begin to become frightened by the same noise we associated with our protagonist's dreams. We cringe at each CRASH and have to look away at each BANG, because it's no longer a dream he's going after, it's a obsession. This movie becomes more than a celebration of sound, but also a thrilling psychodrama about a musician on the brink of a mental breakdown in order to achieve musical success. And more importantly, it is also gripping drama about the relationship between a music teacher and a student striving for power in setting where only one can be on top. And it is Miles Teller who stars this student and it is he who continues to impress me in not only sweet romantic comedies like That Awkward Moment and Two Night Stand, but dramas like The Spectacular Now, but here he is Andrew, in a role quite different from what I've seen him do previously, but his performance is what makes this film one of the most intense movies I've seen in a while. When we meet Andrew, we see he dreams of being a great jazz drummer and when Fletcher offers him the chance of a lifetime to play with his band, he jumps at the opportunity, but soon he realizes that maybe he's bitten more than can chew as he soon sees that Fletcher achieves such greatness from his students all verbally and emotionally abusing them, ultimately beating them into perfection. Andrew and Fletcher go head-to-head in this movie, each one battling for perfection and power.And when I say power, I mean in the aspect that Fletcher wants to hold all of it in order to achieve greatness in his band and in his students and that Andrew wants to take power in his drumming in order to become the greatness that Fletcher wants to see, but to what lengths will each of them go to achieve said greatness? And what lengths will we stretch our own humanity to achieve our own goals? What starts off seemingly as a simple, slow jazz flick quickly transforms into a Black Swan-esque psychological drama about a boy wanting to achieve greatness and the teacher leading him down a dark path to do so, involving literal blood (and a lot of it), sweat and tears. At the beginning, Andrew is shy. He's lonely and we get a sense of that as we see him longingly looking towards the others having a conversation in the band room. We only see him socialize with his father at the movie theater and eventually, a girl whom he's met at the theater before who he later begins to date, a positive mark for Andrew. However, throughout the progression of the film, when Andrew meets Fletcher, we see his demeanor begin to change. He's harshly sarcastic, he's rude, he breaks off ties with his girlfriend and that longing look he once had for friendship is now turned towards a drum set as his dreams to become a better drummer intensify, but besides Miles Teller's beautiful performance as both the shy Andrew we meet at the beginning and the manic drummer we meet later on, we also need to note the catalyst for said change and that is Fletcher. But what is Fletcher's reasoning behind his dangerous teaching methods? It is that he wants to create brilliance. He does believe in his students. He believes in Andrew and does all this in order to manifest and control this brilliance within him and Andrew is willing to push himself as far as he needs to be to impress Fletcher, even goes so far as to bleed for him during practices. But whether or not his teaching methods are ethical isn't up to us, or anyone for that matter, what it's about how when there's this imbalance within a power struggle between two people, it can destroy someone or even both of the people and turn them into someone they're not, bringing them past the point of no return. But how can one be tested to their limits without being pushed past their breaking point? How does one have this yearning for perfection and achieve it without it ending in disaster? This film presents the art of music making similar to that of a boot camp. You need discipline, training, resistance and immense amounts of mental strength when it comes to making music and more importantly, the criticism that comes in music making. All Fletcher does is criticize Andrew and instead of brushing it off and trying to become better in a healthy way, it breaks Andrew. It drives him, yes, to become better, but in a way that is detrimental to his body and mind. He's bending backwards and breaking himself order to impress this man who is his teacher, but why? It is because Fletcher is a critic and Andrew takes it all to heart, even though it is more more verbal than a written. His ability to live and breathe this music is a talent only a critic could hold as he's able to sniff one off-beat player in mere seconds. Criticism is more so than just judging something. It's more so the explanation of something in order to understand the medium as whole, and sure, it leads to many negative outcomes and representations of art, music and etc, but it also helps us shed light on the good and the bad about art as a whole. But how does an artist take criticism? Well, Andrew delves into a pit of misery and self-mutilation as he directly confronts his faults repeatedly, which is where he went wrong. One should push themselves to be with themselves completely and include their art in that transformation and what Fletcher wants is for them to explain it and push for perfection and he does what he does in the name of art, but that doesn't make what he did right. 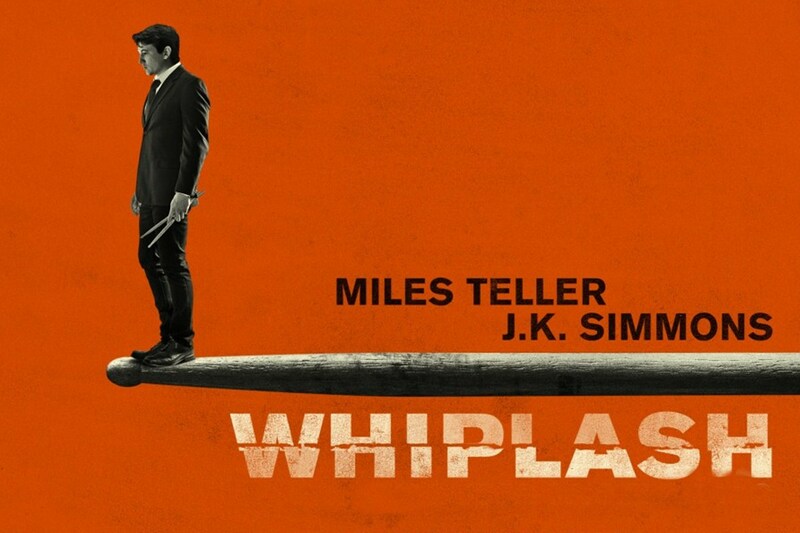 Whiplash is a powerhouse of a film without even meaning to be. The beautiful cinematography, Andrew's hopeful beginning and eventual ambiguous downfall and end and the impeccable writing are all reasons to see this film. And so often do you know where a film is headed, but here I was on my toes, I was wanting more and most importantly, I was feeling something at every point in the film. Never have I been so uncomfortable in a film and yet so fascinated at the same time in a film, especially one about jazz music and it was all worth it because as soon as I finished this film, I was completely and utterly amazed.